In Francois Truffaut's probing essay, "What Do Critics Dream About?" which opens his book of movie reviews, The Films in My Life, he writes, "I demand that a film express either the joy of making cinema or the agony of making cinema. I am not at all interested in anything in between; I am not interested in all those films that do not pulse." Of course, Truffaut (as both movie director and critic) is talking about the kind of visionary work where artists who break the bounds of convention risk not only alienating an audience, but also their own sanity in order to make their movie "pulse." That would include Erich von Stroheim's 1924 epic tale of avarice (Greed), Abel Gance's thrillingly lunatic Napoleon (1927), Orson Welles' groundbreaking Citizen Kane (1941), Bertolucci's equally inspired and crippling 1900 (1976), Martin Scorsese's ambitious musical, New York, New York (1977), Francis Coppola's metaphoric dirge Apocalypse Now (1979), Michael Cimino's amorphous western Heaven's Gate (1980), Werner Herzog's lunatic Fitzcarraldo (1982) and Terrence Malick's madly idiosyncratic The Tree of Life (2011). Whether any of these films achieve the artistic heights their directors intended is not the point. They were clearly movies perfumed in the joy or agony of their creator's need (or megalomanical desire) to stretch the art form – and if they didn't always work, they often made better films possible in those they inspired. But when it comes to Alejandro G. Iñárritu's epic adventure The Revenant, which has been piling up awards and accolades for its own daring, perhaps another category should be considered: the job of making cinema. For unlike the previously mentioned work, Iñárritu conceives his films (21 Grams, Babel, Biutiful and Birdman) as highly controlled endurance tests where the risks become self-consciously employed and (despite the director's enormous skill) the material turns into a mountain of familiar dramatic clichés. Based in part on Michael Punke's novel, which draws on the experiences of the fur trapper and frontiersman Hugh Glass, The Revenant is an epic and artful tale of revenge and redemption, but the motor running this mystical journey is fueled by the same blood lust that powers most commercial exploitation action films. Set in 1823, Captain Andrew Henry (Domhnall Gleeson) leads a party of fur trappers into the unsettled parts of the Louisiana Purchase under the guidance of their most veteran hunter, Hugh Glass (Leonardo DiCaprio), who knows the landscape and the indigenous tribes of the area. When they are confronted by the Arikara in a surprise attack, the survivors have to make their way by foot to their outpost. (The attack is beautifully staged as if happening in a delirium, or a fever dream, where cinematographer Emmanuel Lubezki's camera seems to discover the battle as it's occurring.) The decision to trek back doesn't sit well with John Fitzgerald (Tom Hardy) who has developed a deep antipathy towards Glass and his half-native son, Hawk (Forrest Goodluck), which is due in part to his having been half-scalped by natives years earlier. So when Glass gets mauled by a bear as he's scouting alone and discovered close to death by the party, it's Fitzgerald who tries to convince the group to kill him so they can move quicker. Henry decides however to leave Fitzgerald in charge on Glass (along with Hawk and their youngest trapper, Jim Bridger) with the promise that he'll give Glass a decent burial when he dies. But instead of fulfilling the promise, he tries to murder Glass. When confronted by Hawk, he kills him instead in full view of his helpless father before attempting to bury Glass alive. As Fitzgerald and Bridger (Will Poulter) depart for the fort, Glass emerges mortally wounded from his grave and drags himself across the winter landscape bent on getting revenge for his son's murder. Glass' arduous adventure of crawling and staggering to survive for over 200 miles had already provided inspiration for the 1971 Western, Man in the Wilderness, where Richard Harris as Glass got to transcend mortality. Sticking a little closer to the facts than The Revenant, Man in the Wilderness begins with Glass seeking vengeance for being abandoned, but over the course of the story (where he recalls his life in flashbacks) comes to recognize in the end that the hunting party did not mean him harm. But Iñárritu adds the fictional bit about the murdered son to give Glass' revenge purpose rather than reflection. What the audience gets left with is watching a dying Glass fulfill his obligation to his son and late wife, who was also murdered in an attack years earlier, as he gains spiritual wisdom along the way. However, mysticism doesn't come easy to Iñárritu (in Biutiful he had a terminally ill man with cancer have inexplicably psychic powers where he communicated with the dead before they got to Heaven), because he often uses it to provide salve for the ugliness of the picture's conception. In The Revenant, Glass' desire for vengeance provides the drive of the picture, but Iñárritu pulls back in the end from its consequences. Even with its tired revenge plot, The Revanant still makes little sense dramatically. Tom Hardy's Fitzgerald is such an obviously conceived villain that you don't believe for a second that Gleeson's Captain Hardy would leave him with the wounded Glass. The only reason he does is so that we get the murder which sets the revenge plot in motion. If Hardy is left licking his lips with malice, DiCaprio's performance ends up pretty much all grimaces. While it may be audacious to watch, it certainly isn't compelling. (Most revenge stories are so single-minded that the lead characters have little to do anyway but act it out.) As for the infamous bear attack, it is indeed powerful and 'realistic,' but it goes on so long that it plays on our prurience rather than making a dramatic point. Despite the fermented naturalism of Lubezki's cinematography, the conception comes across as a stunt to wow us (just like the single-take nonsense of Birdman which ended up having it swallowing its own tale) rather than heighten our senses. 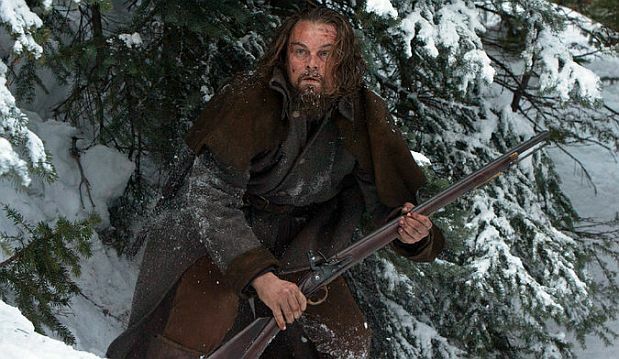 The Revenant retains a holistic side that feels as equally fake as its melodrama. Glass' brief encounter with a friendly Pawnee, Hikuc (Arthur Redcloud), who has also lost family, teaches him that "revenge is in the Creator's hands." But everything by the end is set up to have it both ways. Iñárritu needs to fulfill Glass' desire for revenge by setting up the big violent encounter with Fitzgerald, but he also provides a shaky New Age conclusion to soften the blow. To make a truly risky movie, it requires a director who gives the audience no obvious refuge. But Iñárritu continually does so. He may dress his films in the most artful techniques, but the stories he tells play to the most obvious stale ideas. 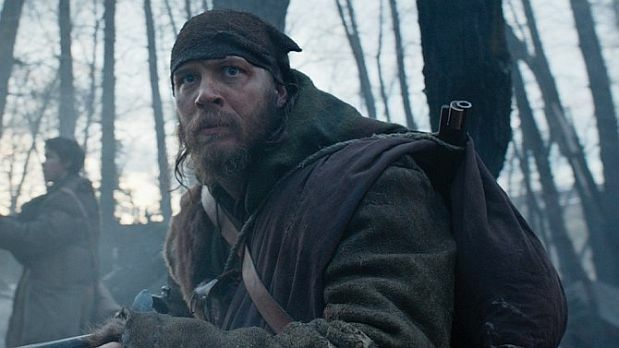 The Revenant gives us nothing more than an endurance test for both its star and the audience. While it is quite successful at imposing itself on the viewer (much as Birdman did), The Revenant is nothing more than a huge, sprawling contraption built on puny twigs.